"41HS3, 370, Burial A-33" by Timothy K. Perttula and Robert Z. Selden Jr.
DECORATION (INCLUDING MOTIF AND ELEMENTS WHEN APPARENT): The rim is decorated with diagonal incised lines. The vessel body has six vertical appliqued ridges that extend from the rim-body juncture to the base, and there are vertical incised lines within each appliqued ridge panel. 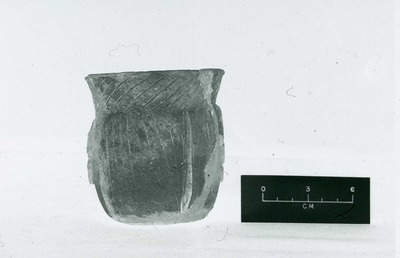 Pease Brushed-Incised jar, No. 370, H. R. Taylor site.